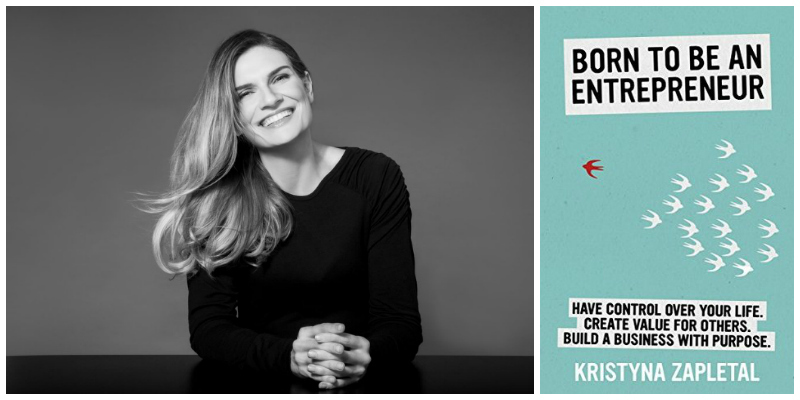 Born to be an entrepreneur by Kristyna Zapletal is a book for mindful entrepreneurs, and it’s very definitely not your typical business or startup book. It has been written for the aspiring entrepreneur who aims to address the needs of people in their community to create a positive social impact, while maintaining control over their own physical and mental wellbeing. Kristyna Zapletal defines entrepreneurship as a means to delivering value, where all starts and ends with self-improvement. She believes that entrepreneurship doesn't just talk about passion for our various projects; entrepreneurship doesn't exist merely to proliferate profitable companies; entrepreneurship doesn't serve the sole purpose of giving people what they want; and entrepreneurship is not only a choice of lifestyle. For her, entrepreneurship is about making a positive impact while having full control of our experience and living our life with a purpose. Kristyna believes that anyone can become an entrepreneur at any point in their lives, regardless of their background, gender, age, past career choices, financial situation, or level of experience. She believes that entrepreneurship is not about individual achievements and resources one has at their disposal. It's a mindset of brave human individuals who have understood that their time on Earth is absolutely limited and who don't wait for someone else to make their existence worthy and pleasurable. Success generates more success. When someone assumes they deserve to succeed, it happens again and again to them. They seem to achieve anything they want. Besides, people around them contagiously adopt the same conviction. Entrepreneurs undertake challenging and risky tasks. They move mountains. They accomplish things others can barely grasp. And they couldn’t do so without courage, constant self-improvement, and hard work. If you aspire to be an entrepreneur, master your own thoughts in the first place. Having control over your mind makes it possible for you to control your whole life, and as a result, to shape the world around you. If we understand entrepreneurship as a means to delivering value, we must realize that it all starts and ends with self-improvement. Kristyna Zapletal coaches leaders, entrepreneurs, and executives of high-growth companies in the major business and cultural hubs across the world to help them build their mental and physical resilience, accelerate their professional growth, and make an extraordinary impact. She is the founder of MAQTOOB, an online platform to discover and review business apps. So far, she has handpicked and curated 3,000+ software tools to help entrepreneurs grow with the help of technology. Together with her team, she has been running the School of Digital Skills whose aim is to show future leaders in developing and emerging countries that sustainable innovation is possible even with limited resources. Kristyna has worked with hundreds of entrepreneurs all over the globe and collaborated with organizations such as the World Bank, Microsoft, or the Global Entrepreneurship Network. Some of her articles went viral with 5+ million views altogether and were published in TIME, Observer, Business Insider, The Next Web and many others. Besides, she started her own online publication MAQTOOB For Entrepreneurs.